Mutton Kaleji Fry Recipe is very easy to make and delicious to eat. If you are bored of cooking same chicken or mutton curries, you can try this mutton kaleji fry recipe or bhuni kaleji masala, as we call it at our home. Kaleji might be having several names – Liver (in English) or Yakrit (in Hindi) – but when it comes to taste, it’s terrific. It’s one of my favourites in non-vegetarian too. Whenever my father goes to bring mutton or chicken meat, he knows very well Kaleji or goat’s liver has to be in the list, by default 😀 . And then I would sit and enjoy the mom-made Bhuni Kaleji masala with Arhar dal (toor dal or split and skinned pigeon peas) and chapathi, my favourite combination with the Kaleji masala. I made this mutton Kaleji masala with mom’s recipe, recently, and it turned out to be fantastic! I along with my family, loved it 🙂 … made my heart grooving!! This Kaleji fry recipe or bhuni kaleji masala is very easy. Anyone who has just started to cook can make it. Just keep in mind, the kaleji or goat’s liver doesn’t take much time when you are cooking it in pressure cooker; two to three whistles are maximum. My advice would be, whenever you make it in pressure cooker, allow only 1 whistle on high flame, and then cook for around 6-7 minutes on low flame. I have used tomatoes too as I like this veggie. You can skip it completely. 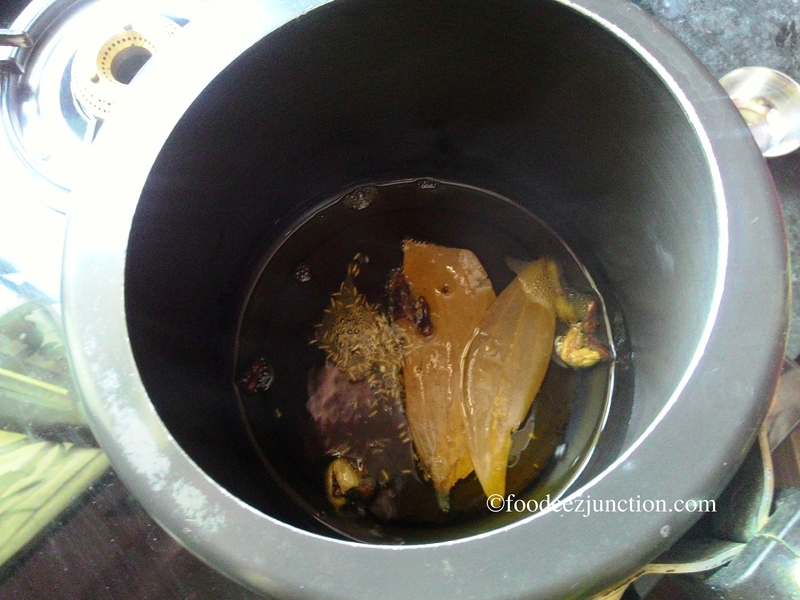 There is no need to put much water too, a small cup will be okay as Kaleji itself leaves water while being cooked. Here is an easy guide to the recipe of Mutton Kaleji, which involves Indian spices, less time-taken and delicious taste! For preparation of Bhuni Kaleji recipe, it will take 10 minutes (cutting, slicing of onions, tomatoes and washing of Kaleji); the time taken to cook the Kaleji fry is approx 30 minutes. Kaleji Fry Ingredients; You will find Black Cardamom missing from the tray here in the pic. Take pressure cooker, put it on flame, let the water dry and then pour oil in it. Heat it. I would suggest you to take Mustard oil if possible; mustard oil gives a nice flavour. Add all the khada masala i.e., laung, dalchini, shahjeera, green elaichi, black cardamom (elaichi), tejpatta to the oil. Saute for 20 seconds on high flame. Now add only 1/2 cup of sliced onion (and save the rest for later use) and saute till it turns light brown. Keep stirring. Add Kaleji now and fry for two minutes. Stir well. 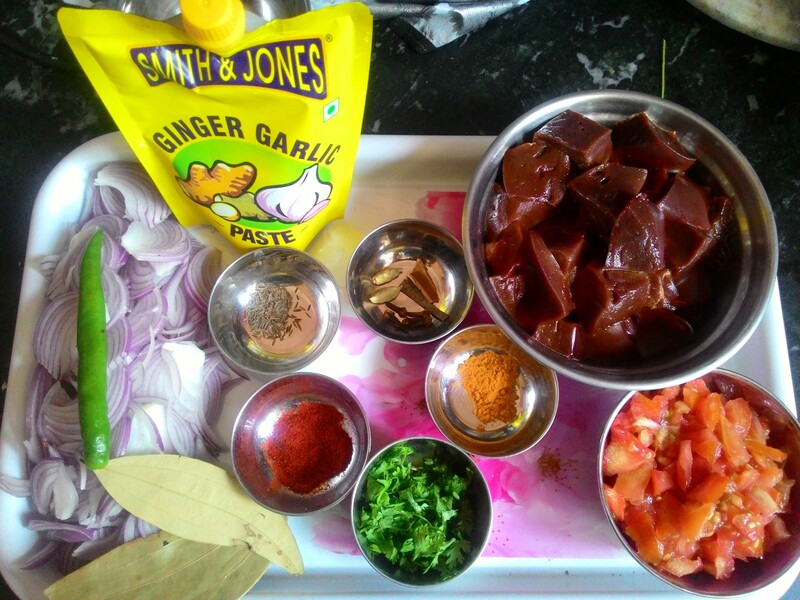 Add ginger-garlic paste, tomatoes, haldi powder, dhaniya powder, salt and mix well. Fry for another minute. 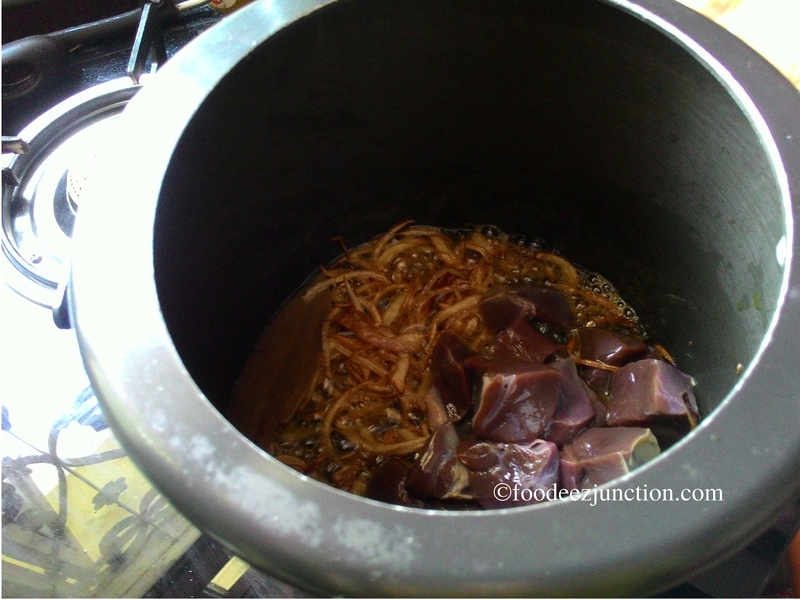 Now add the rest of the sliced onions to kaleji, add 1/2 small cup of water, mix well and close the lid of pressure cooker. Cook till 2-3 whistles. Put off the flame and wait till the steam goes off on its own. Once the steam goes off, open the lid of pressure cooker and put it back on low flame. Add green chillies. You just need to fry the Kaleji for now till it leaves oil. Add garam masala, stir and put off the flame. Your Kaleji fry with easy Recipe is ready! Wow! This looks heavenly! In culinary school we were also taught how to cook curry dishes and was able to use some spices. I know this is authentic!!! Must taste way better than what we did in class! Hey, thanks for stopping by. 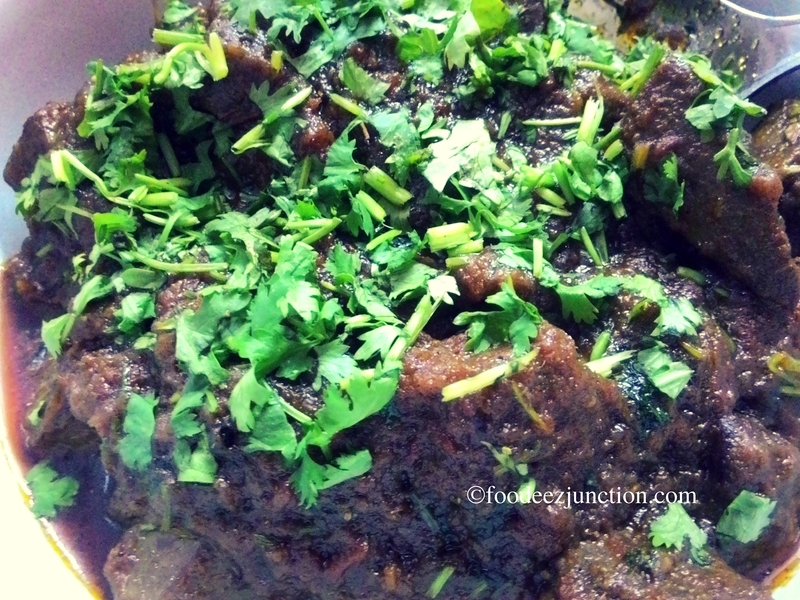 I’m glad you liked this recipe 🙂 … Mutton Kaleji is one of my favourites, and this one is mom’s recipe.. Make it and let me know too how did you like. I too am not sure but you can give it a try at an Indian store there. 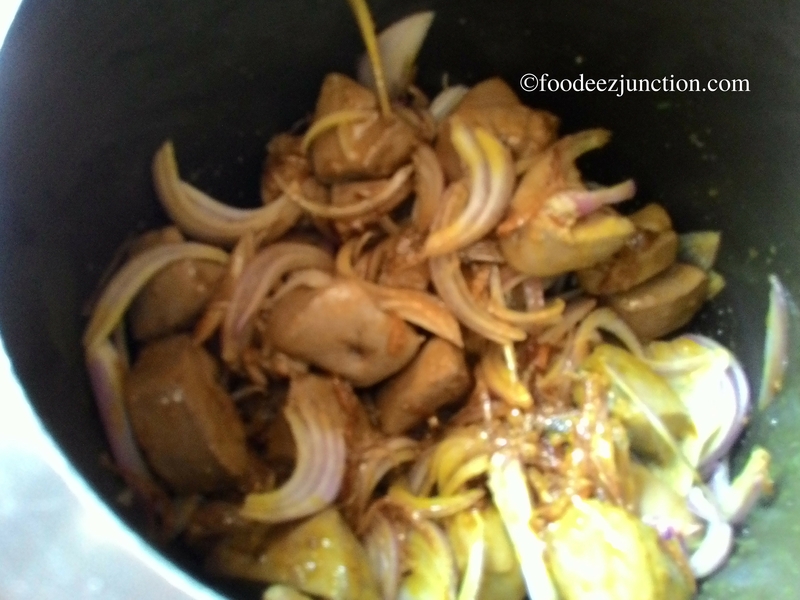 Liver fry is my hubbyy’s favorite and i make it often…..